During October '09 We discovered issues at my work with our Internet Sales sites. Those are based on SAP Internet Sales 2007 (CRM 2007) which are J2EE based applications. It took me a while to find the root of the issue (Memory leak), but I learned a lot in the process and wanted to share some of that. This could be useful to anybody trying to track down memory/performance issues on a J2EE stack, whether SAP based or not. While I was working on this, I was in contact with SAP about the issue (customer message), they eventually confirm the (huge) bug in their code and provided a fix(see SAP Note #1398828) but it took a bit of effort to convince them it was not a bug in OUR code. I also got substantial, unexpected, help from a twitter buddy, John Pape, we talk a lot about Blackberries(he uses my Berry4all software), Hockey, Java and other geeky stuff. Anyway I didn't know that not only he works at IBM(our JVM vendor) but also is a high level support expert for Websphere and is VERY familiar with diagnosis of Java issues and the IBM JVM. I could not have found a more relevant person to help me with this issue. Thanks so much for landing a hand! And I though twitter was mostly useless ! We run some E-commerce sites based on SAP's Internet Sales 2007 (B2C & B2B), those sites get average traffic ~15,000 users sessions a day. We run this on a x86_64 server with 8GB of Ram[Upgraded to 16BG during this issue tracking], 2 dual core Xeon 5420. Early September we started noticing the J2EE server sometimes restarting itself and sometimes just plain crashing (needing manual restart). This of course lead to some downtime and other issues. This is the tough part of course. Usually we average ~500 active sessions, but in this graph you can see rapid "bursts" of sessions every 2 hours. We figured that might have been the cause of the problems because that is unusual. A 1000 session burst in 20mn is very unusual ... but even in SAP where a session is relatively "heavy" this should be able to be handled. This turn out to be the Google Ad bot being overzealous after our marketing department changed keywords. 209.85.238.200 - - [02/Nov/2009:15:07:41 -0800] "GET /some/page?lid=6070Agyh&pcrid=3269128508 HTTP/1.1" 200 8635 "-" "AdsBot-Google (+http://www.google.com/adsbot.html)"
While this was not the issue on it's own ... we figure we wanted to prevent such large burst (we don't want performance slowdown for the customer), so we added some tarpitting(slowing down) using Apache mod_security2 for the Google Adsbot. Tarpitting was a good option because we do not want to block or return error code to the AdsBot of course because it would be detrimental to our SEO. It's very easy to get going on the wrong track when researching this kind of issues. Errors in log files can be very misleading ... once again you might see the side effect rather than the root cause. It can be difficult to distinguish the problem cause VS it's effects. The issues was not easily reproductable on our QA system through a load test, so we had to diagnose it on the production system ... which greatly limits what can be done without affecting the customer. So we had to enable some more logging, error tracing and so on (Ironically the probelm was a memory leak in the SAP Logging API ... so it made the issue worst .. but helped identyfing it). 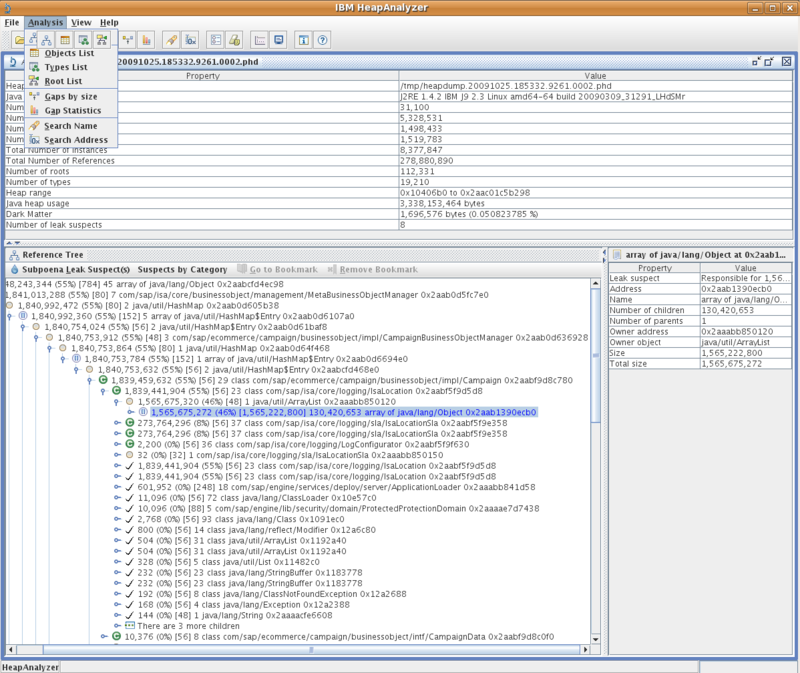 It can be difficult to find the issues in SAP log files, because there are a lot of data in there and many "normal" traces (for example when a user close his browser while data is being sent). So it's time consuming, but using search tools like 'grep' helps. Then I looked at the memory graph in SAP's J2EE and that confirmed abnormal behavior. IBM and Sun have many detailed papers on how each GC algorithm works, and it's definitely worth a read before interpreting GC data and Memory graphs because it can be misleading otherwise. Why OutOfMemory when the memory graph shows for example 500M available ... this can't be right. Why would the logging mechanism use much memory, this should just write to file. 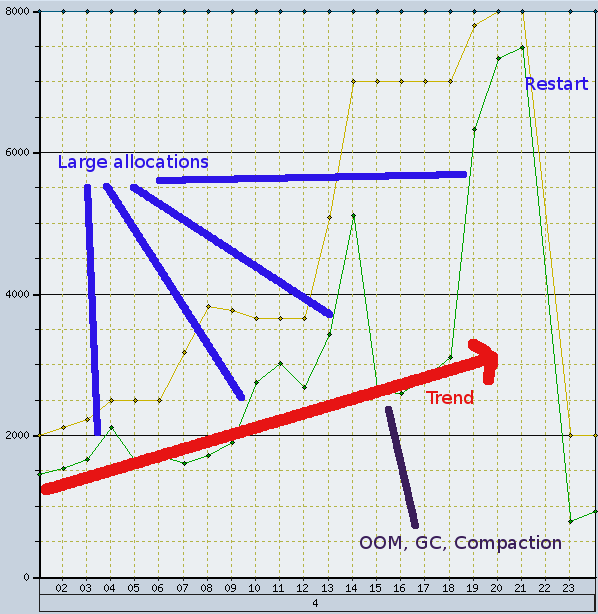 The graph showed very sudden spikes in allocated memory at times (example from 500M to 2GB at once) ! I figure maybe there was something like the logger was failing to write to file(permissions for examples) and holding the data in memory. but there was no such feature. Do not assume anything, confirm it ! It's not always logical and sometimes there are multiple issues making it appear "Illogical". Also I was very curious about those sudden "spike" in allocated memory (abnormal). So my next step was to confirm / find out more about the OutOfMemoryError(OOM). The two most useful data point you can use to work on an OOM are Heap dumps(data about allocated memory) and Garbage Collection logs. If you run a Java 1.5 or newer JVM, there are many nice tools, because I was on Java 1.4 my options where more limited. 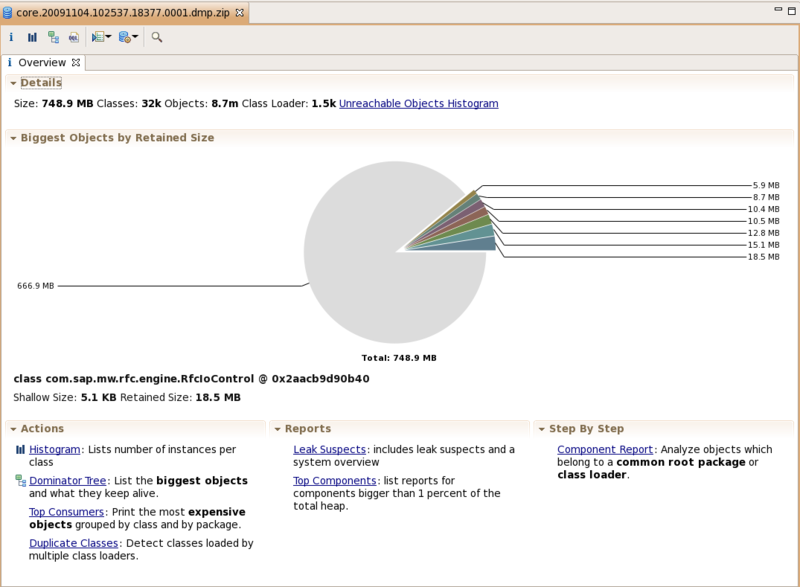 I've actually ran SAP on java6 before just for this,using VisualVM, see profiling_sap_isa_j2ee_webas_with_netbeans. -verbose:gc requests Verbose Grabage Collcetion infos. -Xdump:system:events=user,request=exclusive+prepwalk+compact With out IBM JVM 1.4.2.13 this requests Core, Heap and Thread dumps to be written in case of a JVM/GC error (or compaction which usaully only happens after memory allocation failed). Note that this writes very large files to disk (2x memory size) so make sure you have disk space. The ones of interest in this case are the core and heapdump files(Memory data), JavaCore and Snap contains infos about the threads. Eclipse Memory Analyzer which was actually orignaly developped by SAP and released opensource, thanks!. 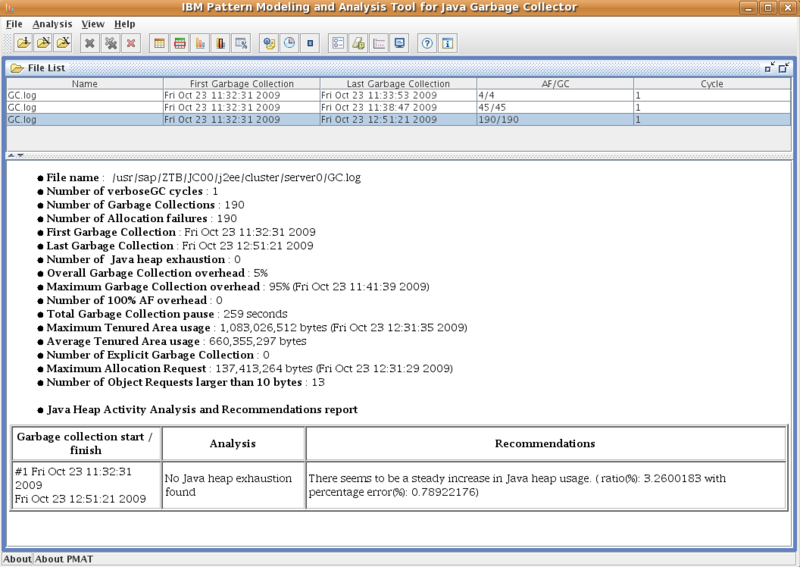 IBM Garbage Collection Analyzer - Let you see what the GC is doing from the GC logs. In my case Eclipse MAT was the first choice because I have to analyse an IBM java 1.4 dump (VisualVm does not support that I believe). Also using the GC log analysis tool, I could see the leak and that pointed to IsaLocation as well. <minimum requested_bytes="206119888" />    // 200M ! <minimum requested_bytes="309179824" />    // 309 M ! <minimum requested_bytes="463769728" />    // 460M ! Only cow ! what makes such insane allocations ?? This also explains why it would OOM even though it appears some memory was available, if 1GB is avail but it requests 1.5GB it won't happen. Well I already know it is ISALocation .. but would it not be nice to catch it in the act ? However for some reason that did't work for me ... maybe I did not set the variable in the right place or maybe the SAP environment ignored it ... I don't know. Anyway John pape at IBM provided me an internal IBM tool called "object profiler" that does the same thing but does not need an env variable and that worked great. * contain the packagename and classname. * @param name - the name of the current location. So basically getInstance() was just filling up a static arrayList with Class objects everytime it was called, which is a lot, since it's the logger. The ArrayList implementation increases the array size a bunch when it gets full (I guess about doubles in size, too lazy to check, javadoc doesn't specify) and that explained the large allocations requests(ever larger) I would see. That array was never emptied, or even used, in case you wonder ... SAP fix was to remove that array all together. No clue how such piece of code ended-up there ... maybe it was for debugging and got forgotten ?? Either way if you are looking for a piece of code to get an OOM dump this will do great ! Well the thing to know if that there are excellent tools out there to help you, also triple check your hunch and don't guess or assume anything from just one set of data. 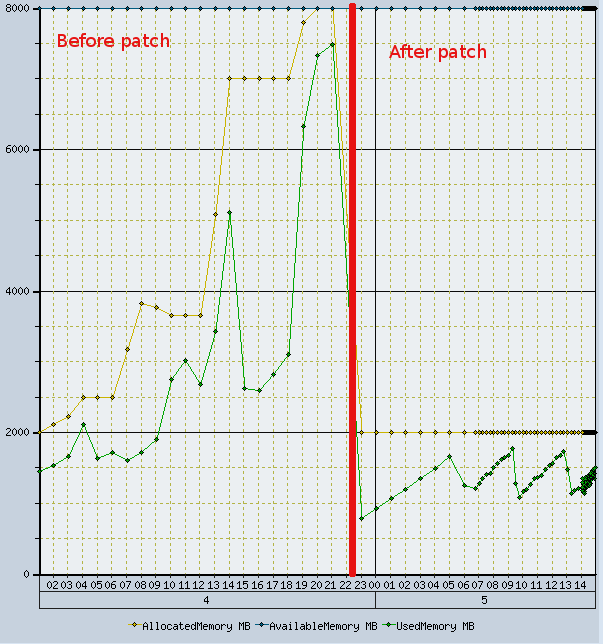 Here is a graph showing the memory use the day BEFORE applying the leak fix, and the day AFTER, much better !